An updated rendering of The SoNo Collection, with the old rendering showing a hotel in the upper right hand corner. Updated, 6:50 p.m., a graphic and GGP handouts added. 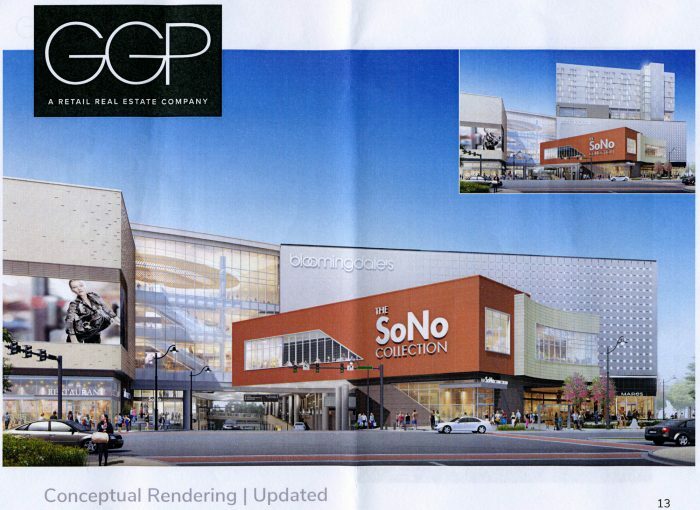 NORWALK, Conn. — Flexibility is key in the changing retail business, GGP Senior Developer Doug Adams said Monday, in defending a proposed change to the language for The SoNo Collection. Common Council members, asked to begin the process of excising the hotel planned for the proposed mall, zeroed in on what Adams called a “clarification” of high end anchor. “You also felt a need to modify mall classification,” Council Finance Committee Chairman Bruce Kimmel (D-At Large) said to Adams. “That bothers me. Why did you feel that need? The Council Planning Committee voted unanimously to move the issue to the full Council – but the issue is simply to begin the process of modifying the Land Disposition Agreement (LDA) for the West Avenue property, formerly referred to as “95/7,” to remove the hotel/office/residential component. The Council will vote again on whether to approve the changes, and the Redevelopment Agency will also vote. Then the change will make its way through Zoning. “It’s not the end of this discussion it’s nearly the beginning of it and getting the documents in line, if the Council is inclined to do so,” Redevelopment Agency Executive Director Tim Sheehan said. GGP came to the city around Christmas to announce that it had found hotel, office and residential space to be infeasible, triggering four months of discussion, Sheehan said. GGP had worked diligently to design its hotel, down to selecting finishes and planning verticle transportation, but the profitability doesn’t add up, Adams said. F.D. Rich Co. recently began construction on a Residence by Marriott Inn next to the Norwalk Police headquarters. “It’s always been recognized that direct competition, whoever got in ground first was going to capture the market,” Sheehan said. An information sheet from GGP. The projected cost of building hotel had gone from $50 million to $56 million, Adams said, calling that “exorbitant.” A third-party consultant projected a 4.4 percent rate of return, half of what is needed. Office space would get a 4.29 percent return and residential would get a 3.3 percent return, he said. “I think that’s the theme in general. This building costs twice as much as what the market will support for those uses,” Adams said. Nevertheless, GGP would like to begin construction by May 1, excavating the mall according to its existing planned footprint, Attorney William Hennessey said. “Mobilizing a big crew takes time,” Hennessey said. The city’s process to approve the changes would take until June 1, Sheehan said. GGP is looking to meet its obligations to Bloomingdale’s and Nordstrom, and open in October 2019, Adams said. GGP volunteered to compensate the city $3.5 million for the loss of the hotel, with the aim that the money go to improving the neighborhood in some way, Hennessey said. The loss of the hotel decreases the tax payments to the city about $200,000 a year, Adams said. It means 105 less jobs. Council member Tom Livingston (D-District E) asked Attorney Eric Bernheim what would happen if the city refused to approve GGP’s request. There would be mediation and arbitration, and then it could go to court, Bernheim said. “I believe you’ll tie up the property for many, many years,” he said. 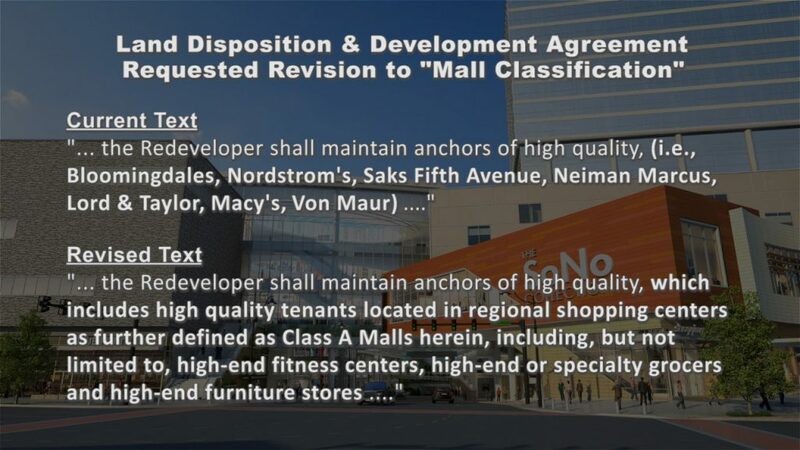 The issue for Council members was the proposed change to the mall classification, which excises a definition of high-end department stores as “Bloomindale’s, Nordstrom’s, Saks Fifth Avenue, Neiman Marcus, Lord & Taylor, Macy’s and Von Maur” and changes it to “high-end entertainment concepts, high-end fitness centers, high-end or specialty grocers and high-end furniture stores” for at least 15 years. “There’s a lot of changes in our industry. We do, in fact, have grocers in our Class A malls,” Adams said. Livingston asked if high-end entertainment could be a movie theater, and Adams said yes. “In theory, if one of our anchors came to us, and said, ‘We can’t move forward,’ then we would have to move forward to replace them,” Adams said. “The city would have to approve that that is an anchor of high quality. If there is disagreement then there would be a process,” Sheehan said. Bloomingdales and Nordstrom are committed, Adams said. GGP is obligated to have a Class A mall for 10 years, and high end anchors for 15 years, he said. The company is motivated “just from a business point of view” to have the best possible anchors, he said. Adams was forced to defend the Class A mall business. And so the bait-and-switch game played by GGP continues… by the time this is finally complete, the concept of “high end” will be redefined to include retailers like Bob’s Furniture and Dress Barn. But hey, we could always use a Cinnabon to draw those high end shoppers from the surrounding communities. I think that the Mall without the Hotel is the best option. The Hotel would probably out live the Mall then we would have a similar problem as the Office building that is currently above the old Pathmark Mall. I think that the Pathmark Mall would have been torn down and the land reused if it did not happen to have a office building with offices of the Social Security in it. So, let me understand what GGP is trying to sell us… Two hotels within a mile of eachother are not feasable. BUT! Two movie theaters that are? Who is doing their market research? How is it Stamford can get many major mixed use projects out of the ground simultaneously and Norwalk can’t? Is it because they are better negotiators and hold developers accountable? I believe that the issue of the planned hotel near the police station was raised early on and GGP claimed there was room in the market for both. At what point did it become the city’s responsibility to make this project profitable for GGP? An entity who never had a presence in Norwalk before 2010? City got badly out maneuvered here. I have been a big proponent of this, but this is quickly heading the wrong direction quickly. Malls are evolving, GGP understands this. Nordstroms and Bloomingdales, great. I see no problem with a furniture store, movie theater or a Dave & Busters or a market either. It makes it viable, gives a variety of people a reason to come. If Norwalk keeps messing around with this, GGP will miss its building window, potentially losing its high-end anchors. I’ve lived in Norwalk for 21 years. Right after I moved here, the auction house and the other stores on West Avenue there were torn down. That land has sat there under-used and under-taxed for 20 years. It’s an eyesore. And that’s OK? Enough! Make a decision and get this thing out of the ground. If I remember the original plans for the hotel on Main St., it was to be a “boutique” hotel catering to, yes, wait for it… an “upscale” clientele. Does Residence Inn by Marriott fall into that demographic? Sounds like a different chapter in the same story of Norwalk “gettin’ rode hard and put away wet” by property developers. The only (and last) time I made the mistake at staying at a Residence Inn, the room I was given reeked a stale cigarette smoke. At my insistence, I was shown 2 other rooms, which also reeked. At least the drunks partying in SoNo on the weekends will have someplace to crash instead of getting out on the road late at night. Let’s stop fooling ourselves and allowing these developers to manipulate our council members. They don’t want to build, it won’t be profitable for them. The market for malls and stores in general are changing. Stores are closing all over the country. Why is this mall so different and resistant to the market shift that is going on all over the country? This will end up as the staging area for the Walk Bridge Construction. Wake up! William Hennessey, the attorney representing the SoNo Collection, donated $500 to the Mayor’s re-election campaign. John Suchy, the husband of a partner in Hennessey’s law firm, donated $100. Did any other people connected to the Mall project make campaign donations to Rilling or any other local candidate? As a candidate, Harry Rilling opposed the mall. As mayor, he supported it. Then he negotiated a deal that improves the project’s profitability for the developer. From what I know of Harry Rilling, he is an ethical person. Still, I’d like him to explain why the revised deal is now acceptable when before it wasn’t. Lastly, to avoid any appearance of a conflict of interest, I’d like the Mayor to return all campaign contributions from anyone associated with the Mall project, or with any significant business before or with the City of Norwalk. A hotel is not the right choice for this location. What SONO needs are some boutique hotels and perhaps that is what the Pearl should have been- what that area needs is for some Class A office space. I want to see GGP and the city both be profitable and successful with this venture and I support it 100%. I just want it to start getting built. I think we need to look at this with some historical perspective. The original plan for this parcel of land was to do mixed use (office, retail and housing). The French companies then sold the parcel and the plan to Spinnaker. Spinnaker entered into an agreement also requiring mixed-use. Why this focus? Because it means there are components that keep an area active (versus deserted). So, when shopping or offices close, there are still residential and restaurant uses happening. And when residents leave to go to work, there are others coming for office jobs or shopping. The mixed use keeps an area vibrant and to some degree, safer, because there are fewer times that an area is deserted. Then GGP bought the land and the mixed use contract/agreement (the land disposition agreement, or “LDA”), from Spinnaker. GGP wanted to build a mall. The City essentially said “ok, but you have to keep a mixed use element”. The City negotiated a new LDA with GGP and allowed GGP to choose from various options, including hotel, residential or office. GGP chose hotel. Now, GGP is saying a hotel isn’t economically viable, because they would only get a 4.4 % return on investment (where do I sign up?) and they need double that (an 8.8% return on investment). What caught my attention was that not only is office not viable (and that appears to be true, given the local vacancy rates), but GGP is claiming housing isn’t viable. That is absolutely not accurate, standing alone. But this article makes a subtle distinction: it doesn’t say that all housing isn’t viable, just that housing in a residential tower over the mall isn’t viable (again, an investment return rate estimated at 3.3%). GGP’s proposed solution is to give the City $3.5 million in lost tax revenue for the hotel. Ok, that’s good. But it’s only a beginning. If we, the City, are going to let GGP get out of any mixed use obligation (I think this was GGP’s preference from the start, and wow, here we are) – if we are going to release them from the contractual obligation to do mixed use development on this parcel, we should still require a residential component from them, because residential is absolutely, positively viable. GGP has always said “we don’t do residential”. That’s fine, let’s not get caught up in whether they are in that business. Lots of others are in the business. GGP has an obligation to the City, an obligation that goes back to the French companies, an obligation they bought, an obligation they directly contracted for (mixed use). The City spent undoubtedly hundreds of thousands of dollars, relocating the people who used to live in that neighborhood, and then likely that or even more in eminent domain litigation with Maritime Motors. There was literally a promise to Norwalkers – yes, we are tearing down this mostly residential area, but we are replacing it with offices, restaurants and new, nicer apartments, anywhere from 35 – 52 of them! While residential in a tower over a mall, as envisioned in this plan, may not be economically feasible for GGP, residential units that will house people earning in the income range of $35,000 – $65,000 is currently identified by Norwalk as the greatest need of the City. All the expensive housing development along West Ave. and Wall Street has NOT changed the need: in Norwalk more than 50% of homeowners and more than 50% of renters are “housing cost burdened”, and with the re-development of Washington Village (a good and needed thing), rents in that neighborhood are already moving upwards, which will mean even more people are either pushed out or are spending way too much of their income on rent. Why should anyone care about that? Because people paying more than 50% of their income on rent are not paying for other things: they are not getting healthy food, causing our public health costs to go up; seniors are not buying the medicines they need in order to pay the rent, again causing public health costs to go up; kids aren’t getting all the educational assistance that they could – fewer educational enrichment programs, less pre-school, fewer books at home to read, parents working more overtime or 2nd jobs, so less time to help kids with homework, impacting the education gap, again, increasing costs and decreasing outcomes. Here’s my suggestion: If a hotel isn’t viable, GGP should pay the lost tax revenue and should fund (not build) housing for people earning between $35,000-$65,000. This is the population currently being the most squeezed. They can’t afford the market rents at the fancy new developments along West Avenue or the like and they earn just under the “workforce housing” income guideline of about $70,000. Yet these populations include starting nurses, teachers, firefighters, police officers, office workers, retail workers and more: I’d venture to say that within this income group is a huge chunk of the 22-35 year olds who are leaving Connecticut because their starting salaries don’t enable them to live within even an hour’s commute of their work, let alone in the same community. If GGP funds 35-65 housing in Norwalk – let’s say 45 units – then we can bring in non-profit developers to use that fund to help meet Norwalk’s greatest need. This could be negotiated, as we know what per-unit construction cost is: it becomes simple math. Then we work to scatter-site small housing developments around the City. Will the mall be good for Norwalk? That’s not within my area of expertise, but as a resident, I am sure worried about it, and that worry only increases as GGP tries to water down the obligation to have truly high-end stores. I hope we don’t operate from fear, but rather, make sure that what is approved by our representatives benefits us, Norwalk. I do think we owe it to ourselves to consider now and 10, 20, 30 years from now: will we end up with an empty white elephant on one of the prime parcels of land in Norwalk (at the intersection of I95 and Route 7, often referred to as the most prized parcel in lower Fairfield County)? Time will tell but meanwhile, let’s have GGP keep its obligation to Norwalk, now, and Norwalk use that money to create a fund for non-profits to leverage and create that which we absolutely do need now, 35-65 housing. 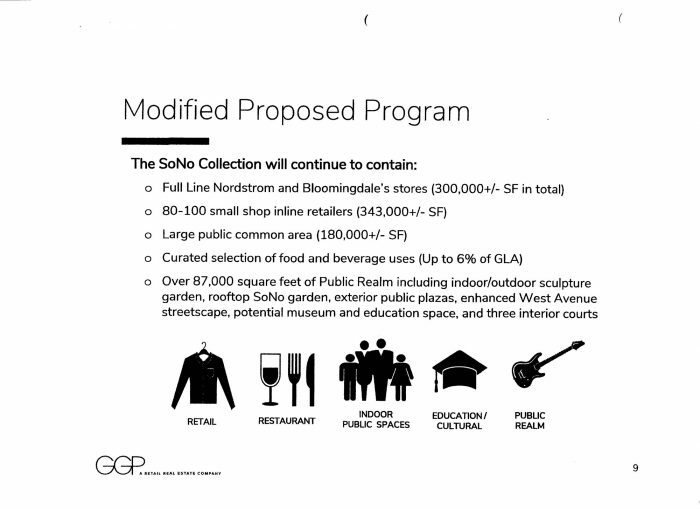 Reminder: TONIGHT – Please join GGP for an informal public town hall regarding the SoNo Collection. Representatives from the development team will provide a presentation on the current status of SoNo Collection and proposed changes to the project plan. Please join us and we can clearly explain the modifications that we are proposing. Nordstrom and Bloomingdale’s have signed leases and are an important part of this project. We are not changing the mall classification, this will be a Class A mall. We are happy to answer all of your questions at the meeting. Please let your neighbors and friends know about this meeting and join us if you are able! In response to Ms. Suib – you should go and check out those developments on West Ave – lots of section 8 vouchers being used to fill them. If people can’t afford to live here, they shouldn’t. Thank you. No reason for the Common Council to approve a new LDA. GGP has been inching forward this inevitability from the start it seems, based on Margaret Suib’s timeline of events. So they never wanted to do residential and had little interest in office space or hotel either, but they agreed to offer a hotel because the LDA required it. The inclusion of one of these three elements–hotel, residential or office space–was THE CONDITION of the LDA. So is the original Land Disposition Agreement now just a worthless piece of paper? I should hope not. Otherwise what kind of precedent is Norwalk setting regarding future development? Promises are made only until the developers don’t find them “economically viable”? Large scale development is a risky business. Part of that risk is committing to something that you’re not sure is going to pan out. And GGP accepted that risk. They knew the job was dangerous when they took it…….unless they calculated the entire time that when push came to shove and the city was tired of waiting for ground to break on the undeveloped lot, the Common Council would fall over and agree to a new Land Disposition Agreement. Other developers have different economic imperatives. GGP is a publicly traded company. They are accountable to shareholders. It’s all about crunching numbers. Let them walk. A vacant lot is better than a bad mall, and infinitely better than an empty and abandoned mall in ten to 20 years. This debacle, from the taking of properties to now, is a complete breach of the public trust, and a dereliction of duties of elected officials. Why, oh why, are they more concerned with the profit margins of a multi-billion dollar corporation than the wishes of our residents???? Mr.Nightingale’s comments last night as to the ridiculousness of a city now stuck having to micro-manage a mall hit the nail on the head. How on earth did we have years of Common Council terms and multiple mayoral administrations that allowed this this parcel to languish yet continue to allow Redevelopment Agency to flourish? @GGP, do Nordstrom and Bloomingdale’s have contractual “opt out” provisions that exempt them from occupancy if their companies are failing? I would like to see their contracts with GGP. Also will you be serving sliders and wings and offering free game tokens? If you’re going to win over the public, you need to give them the full Dave & Buster’s experience. And make lots of GGP Koolaid while you’re at it. The Norwalk Common Council should hold GGP to their orignal plan, or have them forfeit the project. What nonsense this is. Just another case of a developer promising one thing, and the maniupulating city for their own needs. Can it possibly be that GGP is incomeptent to the point of not being able to project profitiblity two years out, let alone 20? Nope, these people are smart, and the CC is outclassed. Let them show they’re not in lock-step with City Hall and use their common sense. Otherwise, yep, “same old Norwalk”. With all due respect to Ms. Suib, what we don’t need is more affordable housing. Property values are in the tank because of what this city has become. Time to start thinking about the taxpayers of this city. In 2013, Saks Fifth Avenue announced it would be leaving Stamford Town Center because of poor profitability figures. It was replaced by Saks Off 5th, the ugly step-sister to the high end retailer. At the time, Craig Johnson of Customer Growth Partners in New Canaan, professional consultants to the industry, said in the Stamford Advocate that anchor stores at most malls have 25 year leases. Why then is GGP only getting 15 year leases out of its anchors? The current proposal from GGP is a bum deal for Norwalk, especially in light of GGP’s very recent request to change the Land Disposition Agreement so they can drop the hotel, Their claim that only recently did GGP realize a hotel would not be sufficiently profitable due to the proposed development of a Residence by Marriott Inn near the Police station is specious if not outright deceitful. Main Avenue is home to multiple hotels at every price range, including Hotel Zero and Hotel Even. I’m sure South Norwalk can handle the extra capacity of a high end hotel near the interchange of 95 and 7. Face it. GGP never intended to build the hotel and ALWAYS intended to change the LDA. DON’T LET THEM. Last I checked the LDA had no stipulation that GGP had to build at a loss. To the extent that the City, or any other entity, places burdensome restrictions on this project (such as pay for housing elsewhere etc.) is to risk killing this deal. Remember, we killed the last two (Spinnaker and Fred F. French) over the last two decades by dragging out the process. Should we shoot for three decades? The changes in the Retail market nationally, and office markets locally are significant. A developer needs to take these into consideration. That’s just good business. If you really want to effect “positive change” call for a change in Norwalk’s process of dealing with issues like these. Two failed deals on this site is one too many. Three would be ridiculous. Mr. McGuire, sounds like you are suggesting that any bad deal is better than no deal at all at this point. By the way, nothing in the provisions for mixed use would result n GGP operating at a loss, rather it just wouldn’t be as much profit as they’d like. Greed. Not sure why the Common Council, who represent the taxpayers, residents and voters of Norwalk, should yield to an extraordinary (but probably predictable) request to fundamentally change the Land Disposition Agreement for this parcel–an agreement that ALWAYS stipulated a significant portion be developed as commercial office space, residential space, hotel space, or a combination. This was always to be a mixed use development. If GGP can’t turn a profit with a mixed use development and won’t move forward if they can’t get their way, the Common Council should le them walk. Other developers will have different thresholds for profitability. 4.4% might be enough for another developer. This request is just GGP trying to get its way and is motivated by the DEGREE of profitability anticipated. So it’s incorrect to suggest that the hotel will lose money. It simply won’t make us much as GGP would like. In other words, it’s as Diane says. Greed. 30 minutes from Cranbury to Rowayton in day time traffic right now without the mall or the bridge projects. Bike lanes aren’t going to fix this either. I wish half the energy and enthusiasm here would be directed towards the state which is totally shafting us on funding. How many billions do we have to send Hartford before relief happens? This could be open space if we weren’t scraping for a few million here and there every year. $500 million in annual tax revenues from Norwalk businesses and taxpayers every year and a few kickbacks and photo ops in return are not getting it done. Norwalk has more than its fair share of affordable housing. Most people who live in Norwalk would say that we have far too much. These units that she is proposing have a negative affect on property values in the surrounding areas and in the rest of the City. This is the main reason why our property values are long stagnant while those of our nieghboring towns continue to rise. Therefore, we need LESS, not more. I would prefer ro live Greenwich, But I cannot afford it. Wouldn’t it be great if there somone who looked outside of Norwalk for more affordable housing? What about Darien or Westport? How close are they to the state target of 10%? There was a time not many decades ago when it was logical to plan 25 years ahead. Back in the early 20th Century, entrepreneurs were planning 100 years ahead. Those days are long gone. Conditions even 10 years out are not going to resemble current conditions. The notion of planning ahead “40-50-60 years” is completely absurd. The paradox is that an entrepreneur must have a business plan, with the numbers adding up right. And plans have to assume a future that in basic ways resembles the present. Yet it is easy to demonstrate that a future like the present is exceedingly improbable. A successful developer is one that sells its properties just before potential buyers are aware that a crash is imminent. There is a world-wide building boom underway, and in my experience, that is a warning flag that a bust is not far off. So if GGP had savvy investors and managers, their best bet might be to give the property to the city as a park and take a tax writeoff. Sadly, I am sure its investors would take a dim view of this strategy. I keep thinking what we will do with 1.2 million square feet of abandoned parking garage. I suppose it could be collapsed in a controlled explosive demolition, and we could cover it with soil and make a park. I persist in the view that skipping the intermediate step of building the mall would save everyone a lot of trouble. This mall must be put to a stop. Any of our elected official that disagree with stopping the mall and adhering to the will of the taxpayers must be removed from office. If I understand the city charter correctly, it does provide a provision to remove the Mayor from office. He needs to keep this in mind as he leads from behind. Tell us what happens to that lease from Bloomingdale aka Macys when they file for bankruptcy? Oh that’s right the lease is null and void. Create a park. A MASTERPIECE. In the center of the city. I place people want to visit. Connect it to the other parks (Matthews,Ouster) in the city by bridges and overpasses. You want to create a DESTINATION? This is how you do it. DO NOT create a ghost mall. Build elements that have not been seen before. That is how you improve the city. Someone is getting rich off all this. But it’s not Norwalk. It’s not our schools. It’s not out traffic jammed streets. A masterpiece park would fill our restaurants downtown. Would fill the empty storefronts. Would bring traffic to our downtown. THE MALL IS MOT GOING TO HAPPEN. GIVE IT UP PEOPLE. hope you are well Nancy. General Growth Properties filed for bankruptcy protection in 2007, forcing the ouster of the Bucksbaum family from the company and suspending dividends. The Bucksbaum’s lost 97% of their family fortune. The company has since come out of Chapter 11, and in January 2017 rebranded the as GGP. At the time of their bankruptcy filing, they were the largest mall operator to every petition for protection from creditors. Donald is correct to point out that no one knows exactly what guarantees GGP has that its high end anchors will remain in business. Bloomingdales is closing stores. First the grand staircase went on a diet and became a staircase of normal size. Then they started trimming skylights. And then the boutique hotel evaporated into thin air. This is staring to feel like an episode of The Leftovers. @Gordon Tully – great point about Norwalk taxpayers getting stuck with “1.2 million square feet of abandoned parking garage” and possible future demolition. An audience member at last night’s meeting suggested to me the city should require a multi-million dollar demolition bond, so that taxpayers aren’t burdened when the time comes for the monster to come down. I’m pretty sure I never saw any provision for this in the current LDA, so I encouraged him to submit this recommendation to the Planning Committee, Council, Planning & Zoning Commissions and Redevelopment Agency. GGP are in business to make money. This means their interest in failure is about equal to mine, and that’s good. I just wish I had the same faith in this enterprise that the neighbors who live on North Water Street seem to have. It’s not clear why GGP entered into this project with a good faith attempt to include a boutique hotel when the up front cost to develop the site for a high rise hotel argued against this as a feasible option from the beginning. And the team didn’t have a satisfying answer to the question of why the hotel component fell through this evening. South Norwalk can support more than one hotel. The desire of South Norwalk residents to shop at Bloomingdales notwithstanding, I heard very little from GGP reps tonight to convince me that the current proposal will revitalize Norwalk, specifically South Norwalk and Washington Street. Maybe if GGP sweetened the deal and threw in some free parking, I might bite. Just using common sense. Developers don’t walk away from developments unless they reach a tipping point of not being feasible based on a very clear set of investment thresholds. The hotel component appeared to cross that threshold. 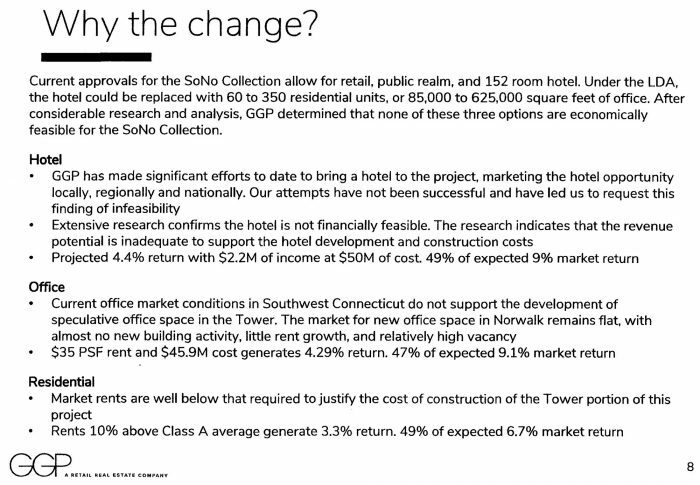 The hotel may have been viable at some point, but clearly with another coming out of the ground in SoNo and the CT economy sliding don’t you think things may have changed a bit in the past 2 years? At this point in time there is no other reasonably feasible development prospect for this site. NONE. But if we continue to drag this out by not understanding the real problem, and instead blame the developer then we deserve another decade of nothing. The process in this City does not lend itself to being conducive to successful developments in the public/private sector arena. It takes to long, and imposes to much, all the while markets shift and the window closes. The culprit here is the flawed process. Until that is cleaned up we can expect the same old, same old of angry citizens railing against the “evil, greedy” developer. The focus needs to be on the process, who administers it, are they qualified to handle transactions of this magnitude, and do they have the authority to execute in a timely fashion. Fred F. French was qualified, Spinnaker Partners was qualified, GGP is qualified. Are we? As others have previously said, this is a tremendously valuable piece of land. It should not be allowed to be developed into something that has so many long-term viability questions. Mixed use, was the vision. But now this has changed. I don’t blame GGP for changing their original proposal. That’s their right. But Norwalk has a right to protect itself from a possible white elephant. Where is that protection? We should all, by now, be quite familiar with the Too Big To Fail syndrome. I’m still hoping this space gets wisely developed. But I’ve never bought into anchoring its future on high-end retail. That is one very risky presumption. No Mall. Thank you to Ms. O”Toole-Giandurco for questioning the viability of the Mall. Who is going to shop there? I am in my 60’s and all of my shopping is done online. My daughter who is in her 30’s, shops online. My 85 year old father has an Amazon Prime account, and aside from groceries, that is his and my mothers ‘go to’ for shopping. We are all Norwalk residents. Who will be at this Mall? Stores are closing right and left due to on-line shopping. No to the Mall. Find another use for this property. Norwalk-take a vote and see how many are actually in favor. The Mall is a big mistake. It will be a white elephant before it is ever built. It’s time that the City utilize its enormous leverage. Please do not let the mixed use mandate be squandered. GGP has already invested heavily in this project. It is unlikely they will walk away if the CC refuses to allow the requested change in the Land Disposition Agreement. The GGP professionals are smart, creative people. The City of Norwalk was promised a mixed use development, and that’s what they should get. Let GGP figure out how to deliver on the non-retail components of the project. Initially, I was excited about the mall – something, anything to generate tax revenues for the city, instead of simply relying on property owners. However, GGP has obviously read the recent release by the US Labor Dept. regarding the continued decline of retail jobs, at an even faster pace in 1Q17 – a loss of another 35,000 jobs, (65,000 retail jobs since October, 2016) suggesting that the initial retail project (and now) hotel is in jeopardy. Scary… Common Council – please do your homework. Actually, the city was not promised a mixed use project. GGP purchased with intent to build retail, the City imposed a mixed use on GGP. The costs to build on top of a huge mall (effectively a high-rise development) are significantly higher than building at grade level. The rents that could be achieved in this market are insufficient to cover these “high-rise” costs. That’s why the new hotel in SoNo is feasible while this proposed hotel is not. Even if you changed the use to residential or office, the rents that could be achieved would not make this high-rise component feasible. Lets not loose another decade, lets get this mall built ASAP so we can recoup on our two decades of loss on this property. Would be hard to stop the development of the mall at this late stage – that shipped has sailed. However, since LDA must be re-opened to consider new mix of land use, nothing to stop NRA or the Council from making some change requests of their own, vis a vis additional public realm and some of the other great suggestions posted here and elsewhere. I’m curious as to where this other GGP development is that has Stew’s negotiating. Let us hope that Norwalk doesn’t end up with a mall that has a grocery store and a fitness edge for anchors. The problem with the SoNo Collection isn’t GGP. It’s the City. This developer is committed to the project and won’t walk. The City is in the driver’s seat. But they negotiate from a position of weakness. The NRA and CC can make requests of their own. But I have no reason to believe they will. @Michael McGuire, the LDA preceeded GGP’s involvement with this property. So NO, the city did not impose the current LDA on GGP. They acquired the parcel from Spinnaker with the LDA in place. Stamford was able to successfully develop mixed use property in some pretty rotten parts of town. But Norwalk fails on an epic scale to do the same thing. The town is poorly run. GGP reps even said the timing of the traffic lights on West Ave now have not been programmed. They are in fact programmable. But the City hasn’t gotten to work on programming them, which is emblematic of the level of dysfunction at City Hall. If the LDA that GGP bought into called for mixed use, then they should have to abide by that. They knew there were costs associated with building a hotel above grade. They accepted those costs until they didn’t. And frankly I don’t care if they build a hotel or an indoor skate park. But the idea that Norwalk is okay with 1,000,000 square feet of new retail and that we’re deluded enough to imagine there will be neglible impact on traffic is delusional. There is good developement and there is bad development. The idea that doing something bad is better than doing nothing and waiting for a better offer is why Norwalk is the retail and discount shopping captial of Fairfield County. There is great potential here to be something more. But that doesn’t seem to be how Norwalk envisions itself. I don’t blame GGP. The failure of imagination belongs entirely to Norwalk. At this point, I’d rather see GGP keep their 3.5 million compensation offer for the loss of the hotel and use that money to enhance the community themselves. At least they seem capable of developing and executing a plan for a park or other community open space. I don’t have the same faith in the mayor and common council. Would hate to see that money wind up in the wrong pockets or paying the same contractors who have let Norwalk down time and again.